Yesterday's bombing at Moscow's Domodedovo airport could not help but remind me of our group's experiences (poets, musicians, and others who had traveled together with the ROVA Saxophone Quartet to the St. Petersburg Jazz Festival and other cities in 1989). We gathered first in the large space where the bombing took place yesterday, checking our suitcases and other bags. Since I had brought a rather large sum of money which I spent in the Soviet Union on trinkets, etc., a couple of the Rova saxophonists asked if I might carry their cash, since they had been paid in dollars, and could take out of the country only the amount with which they'd come in. I readily agreed, and we all moved forward to the large eating facility on the second floor. It was still early, and thought we might get a bite to eat. It was just after noon, and our plane was not scheduled until 4:00. Sitting at tables, however, produced no results. No waitress or waiter appeared. I finally stood and went over to a man who seemed to be dressed like a server. He joined me as we walked back to the group, telling our guide in Russian that he could not serve us without permission from the main office. Where was the main office? I asked. He pointed, and a friend and I marched over to get the permission. There were two women behind the counter, but neither would come forward. As I had seen so many times in Russia, one of them turned away, hiding behind a small curtain and the other just looked down as if we were invisible. "Excuse me, I have a question," I pleaded. I was invisible—and evidently mute. "We can see you," said my friend, "even if you can't see us." "We've been told we need to get permission here." "Permission to eat. We're hungry." They had turned to stone. My friend turned back to the group, while I went forward in the other direction just to explore. A few feet away, I found a small Japanese cafe, open, apparently, and serving. But, unlike the larger food court, wherein our group sat waiting, it was terribly expensive. Soups cost $20.00, some meals went for $50. I was hungry and sat down to eat a small bowl of noodles. When I returned to the ROVA group, I told them about the Japanese spot, but none of them wanted to pay that much. Suddenly, as if a miracle had just occurred, the larger pavilion opened their windows and servers came out to take the group's orders. While they waited, a message came over the loudspeakers—in English—that our plane was slightly delayed. Yet as suddenly as the food began to arrive, another message—this in Russian only—reported that our plane would soon be ready to board. Our guide, relaying this information to us, suggested we leave the food to face the interrogation of the passport inspectors. Just as I have described in my 2006 volume about my visit to East Germany, the inspectors spent an inordinate amount of time stamping things and starring into our faces. The questions they posed were generally simple if somewhat inexplicable—"Why do you visit our country?" "Why are you leaving?" "What are you taking with you?" "What cities have you visited?" etc. etc. The problem was that, no matter how you answered it appeared to be "incorrect." I felt as if they were attempting to keep me there until I confessed some criminal act and intention. It would have been comical except that it was so foreboding, and no smiles were encouraged. Eventually, I was released along with Clark Coolidge and several others. Yet we noticed one of our friends, my roommate Peter Vilms, was still being questioned, and Clark and I determined—unlike the others who had passed through the screening into another waiting room—to check on him. We stood aside for a long while, but he seemed to be making no progress, so I joined him at the window where he was held. "They're evidently upset with me," he explained," because I came into the Soviet Union on the ferry to Estonia." Peter, of Estonian ancestry had arrived earlier than the rest of us so that he could visit relatives in his parents' home country. Strangely, the inspector was speaking only in Russian, a language Peter could neither understand nor speak. The interrogation also included the requisite stares and stamping, but this was far more intimidating, and nothing Peter said seemed to help his situation. The man clearly was determined that something was "wrong" here, that Peter had obviously "up to something," and there was apparently no way to change his mind. For a few minutes, I tried to intervene, explaining he was with our group and visited Estonia only as a tourist. But that seemed to have an even more negative effect, so I ceased, and moved off to the sidelines where Clark and I continued our wait. By now all the others had gone through screening and were gathered on the other side of glass wall for entry onto the plane. Peter was completely stalled, and there seemed no way to free him until suddenly he was waved on. The moment the three of us begin to go through screening, however, three soldiers blockaded the route, pulling down a small wooden bar. "We have to join our party over there," we explained. We tried to get the attention of our friends, but everyone seemed oblivious. Turning again to the guards, I tried to enter, but was barred yet again. We all had our breaking points in this Soviet trip, and Clark's came at that moment as he beat his head in mock-frustration, again and again, against the glass. Finally someone from our group came up to the screening place. "They won't let us in," Clark nearly shouted. "It's okay," spoke the man, "The flight has evidently been cancelled." A while later, we were encouraged to join the others, and we passed through without event. Eventually, the plane was loaded. Evidently, there had been a threat of a strike in Finland, and the Russians were determined not to cross the strike line. We were just relieved that we had made it on board, and before long were rumbling down the snow-covered runway to someplace else. We had, however, missed our connecting flight to the US, and the Russians were forced to put us up for the night in a hotel, a very nice hotel indeed, the Helsinki InterContinental. Sitting down for dinner in the hotel's restaurant, we behaved like wide-eyed Russians visiting the West for the very first time. I think nearly all of us ordered up big steaks, with piles of potatoes and other sides. After dinner, we all took walks, amazed at the gleaming store-windows filled with stylish shoes, jewels, gowns, coats. Helsinki looked like a gem against the night sky. It was as if we had never seen such wealth. Indeed, in that year Helsinki was the most expensive city in Europe. In 2010, the most expensive European city was Moscow! 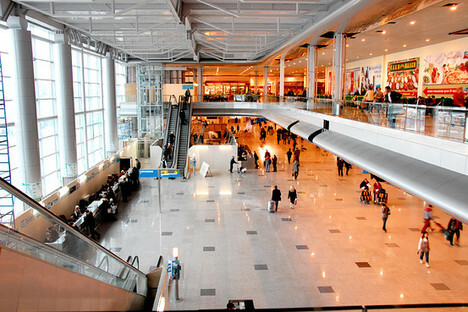 In recent renovations, Domodedovo airport has added 20 new restaurants and several jewelry boutiques. Reprinted from Green Integer Blog (January 2011).